Years ago, Alex Kravets' father, Eugene, was a dentist in Ukraine when he started farming as a hobby. Before too long, he was running a successful produce business that included six greenhouses. He was able to extend the growing season at a time when it was nearly impossible to find tomatoes outside of July and August in Eastern Europe. "These things were valued very highly," Alex explains, "Nobody was doing what my father was doing. Almost everything agricultural was managed by the government." In 1986, just before the fall of the Soviet Union, the private sector in Ukraine was completely dissolved. "All the markets closed in a matter of a few weeks," Alex says, "My father was very disappointed with the government's decision. Everything he was working for was basically for nothing." That's when Mr. Kravets decided to move to New York. He worked as a dental assistant for the first few years, all the while looking for a place to continue farming. 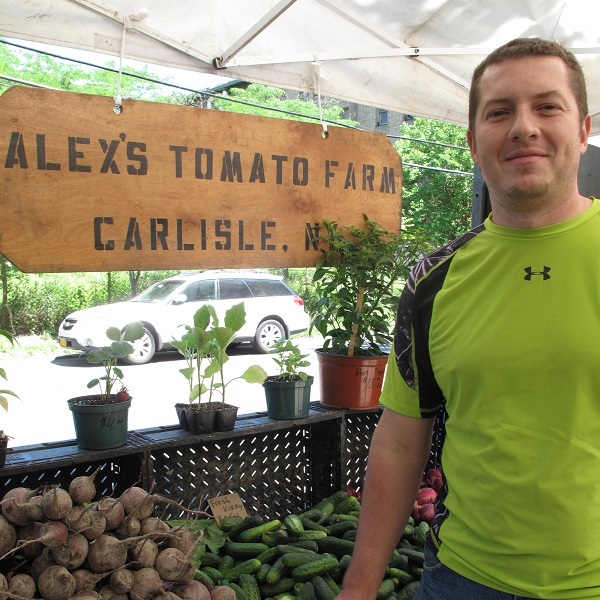 Seven years later, when Alex turned 17 years old, he joined his father in Carlisle, New York, and in 2000, they purchased their first forty acres of land. To honor their early adventures, they included their first crop in the farm's name: Alex's Tomato Farm. Tomatoes were their starting point towards a vibrant and diverse farm today. Now the Kravets cultivate on 70 acres of land and grow herbs, flowers, apples, plums, pears, beans, greens, squash, sweet corn, zucchini, eggplant, peppers, and more. They also enjoy growing a range of varieties of all this produce – and yes -- their crop plan includes twenty kinds of tomatoes alone.